I really struggle to get photos of Blake when we are out and about having adventures these days as he is super fast and doesn't like staying still. On Saturday we headed off to the zoo and one of the photos I managed to get of Blake is of him coming down the slide on his own. Blake is a very timid toddler and is very reluctant to go up and down slides and soft play items on his own. 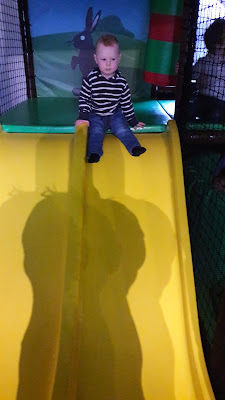 However he chose to overcome this on Saturday was loving climbing and coming down the slide on his own which made us so proud. Well done Blake..looks like a big enough slide.